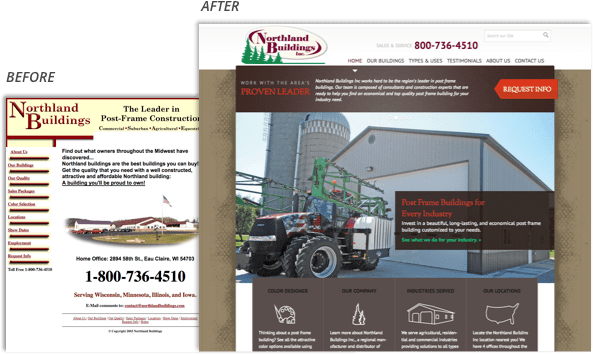 Northland Buildings has earned a reputation as a leader in post frame building construction in the Midwest. They serve hobbyists, farms, and machine shops, providing post frame buildings in a variety of customized sizes and styles. Northland Buildings serves clients in Wisconsin, Minnesota, Illinois, Iowa, Upper Michigan, and North & South Dakota. Northland Buildings originally engaged with Satellite Six with the goal to modernize their brand and customer experience and the intention of getting ahead of their competition, improve sales and lead generation throughout the website, as well as use online advertising to continue to grow their market share in the company’s sales area throughout 7 states in the Midwest. When starting the process in 2013, Northland Buildings was lagging behind competitors due to a dated brand look, lack of mobile design, navigation issues, and outmoded technologies on their website. Their goals was to differentiate themselves and visually reflect quality and longevity of their product in their marketing. We worked with Northland to create a more visually engaging, lead-generating experience for the customers, as well as to focus on a strategy to direct traffic to their new website. Northland Buildings differentiates itself on their Northwoods values and lasting structures. In order to generate high quality leads, we focused on these value propositions and positioned Northland as a key partner in the building process. 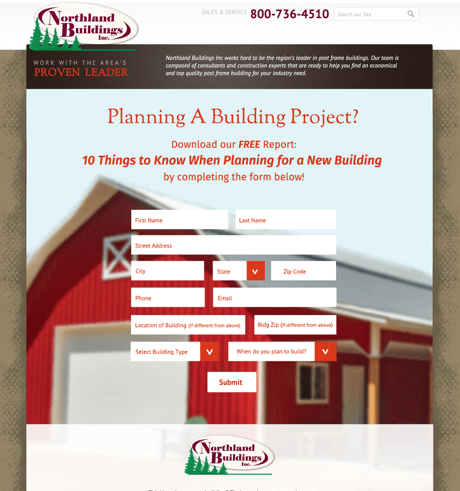 We designed a campaign to drive traffic to a landing page that offered guidance on key decisions customers face when deciding to build a post frame building. We also designed a downloadable guid to capture visitor information, better converting visitors into true sales leads. Following the success of a limited-market 2015 campaign, we worked in 2016 to extend the campaign to all four regions, in which they received 66 leads and $40,000 in closed sales in the first two months. The final result of the seasonal campaign was 298 leads and over $135,000 in closed business for Northland Buildings.